One of the first things Stephen "Thundercat" Bruner said to fans at The Granada was, "Hey, there's a lot going on up here tonight." He was likely referring to the monitor and feedback issues that bugged him throughout his first few songs, but the same sentence described the rest of the evening's happenings as well. Wednesday night's almost sold out crowd was served two hours of jazz madness from the Los Angeles bass virtuoso. Aside from the masterful levels of musicianship that Bruner and his band displayed, one of the most enjoyable aspects of the show came from how Bruner emoted during and between songs. His eccentric personality was visible in his interactions with the crowd -- "stoked" really is the best word to describe his demeanor when his fans engaged in a passionate sing-along. His personality was also injected into his lyrics -- few other jazz musicians can get away with singing about anime, video games, and beating off. The night's setlist incorporated nearly every song from "Drunk," Thundercat's latest, and perhaps greatest, album. The speedy, hectic "Captain Stupido" acted as a fitting introduction into Bruner's world of absurd fusion jazz. Later in the set, a woozy, relatable-for-nearly-any-millenial R&B number called "Drink Dat" had hundreds swaying along. 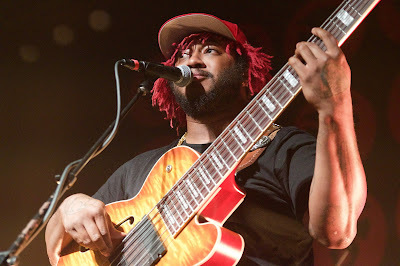 Many in attendance likely became aware of Thundercat through his numerous collaborations and he didn't shy away from performing them. A delightfully stripped-down version of Kendrick Lamar's "Complexion" was performed early in the set. A rendition of his Flying Lotus collab "Descent Into Madness" also felt stripped-down, but sounded bare in comparison to the massive orchestral soundscape created for the album. While it wasn't the final song of the encore, "Them Changes" drew the largest response of the evening. The song's hypnotic, funk-indebted groove was impossible to ignore and Lawrencians danced as if their lives were on the line. The show opened with an unconventional EDM set from Bruner's Brainfeeder label mate PBDY, followed by Japanese musician Saco & Uno. Saco's set was informed more by golden-era hip-hop than electronic music and concluded with a joyous karaoke-style tune during an otherwise-mute performance.